After tremendous success of Mrs India 2016 , Mrs India is calling for entries for Mrs India 2017 .Registrations of Mrs India are in progress selection of Candidates will start from October in diffrant zones of India . Online auditions will start from 1st October for those who cannot attend Mrs India’s regional Pageants and Auditions. Mrs India™ 2016 “I am Woman Eternally Beautiful”, Fourth Edition was hosted in Chennai City at Hilton Chennai on 22nd May 2016. Show was telecasted on National Television NDTV Goodtimes which received tremendous response. Mrs India™ is trademark of Mrs India Pageants and Productions Pvt ltd. Mrs India is annual Beauty Pageant is based on theme of Beauty In Diversity is committed to makes the Role Models Not Models. Mrs India is successfully taking place from 2013.Mrs India Pageant is a National Television show witnessed by Millions of people across the Globe. Mrs India™ is Conceptualized and Directed by Deepali Phadnis .Is the India’s only National Beauty Pageant for married Woman offering International Platform .Mrs India™ is an Annual Beauty Pageant taking place from 2013 , Winners of Mrs India participate in in World’s Most Prestigious Beauty Pageant including Mrs World ,Mrs Asia International ,Mrs Planet. Excellent Track Record Winning: Mrs India™ is proved to be the most successful Beauty Pageant for in the Indian History of Pageants for married woman by winning three International Titles in One year. Mrs India have Won following International Titles in short span of three Years. Mrs India strongly believes Beauty has no Meaning without cause and committed to work on Diabetes Awareness. Along with Pageant’s Cause Contestants can choose to work on any cause the want to work and bring difference in the Society. 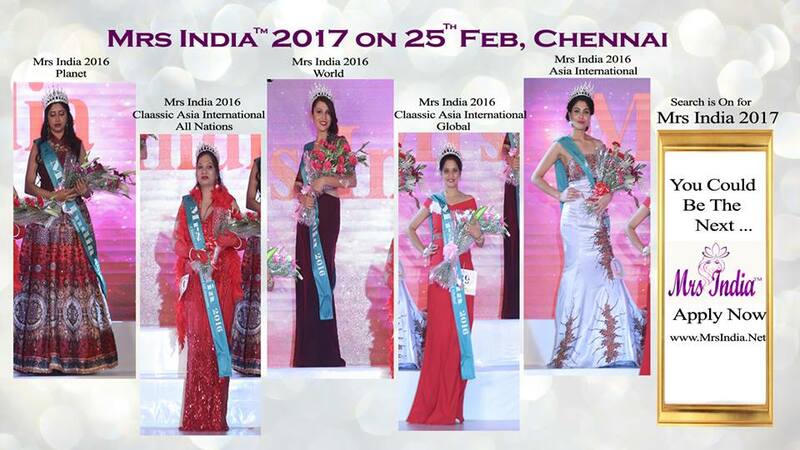 40 Contestant participating from all over India and abroad Contested for Coveted titles in two age Groups Mrs India – Age up to 40 Years and Classic Mrs India above 4o Years of Age . Contestants were evaluated during the course of Pageant through numerous Sub Contests and personal Interview. Apart from main titles Contestants will be awarded many Sub Titles such as Mrs Finesse, Mrs Talented, Mrs Photogenic, Mrs Creative Queen, Mrs Vivacious, Mrs Fitness Guru, and Mrs Inspirational Queen etc. Mrs India is making India’s proud from 2013 and Mrs India 2016 was not an exception. Mrs Asia International 2016 was held at Kuala Lumpur, Malaysia where 30 Contestants from all across Asia Participated. Mrs India made India proud by wining Mrs Asia International 2016 and numerous Subtitles at Mrs Asia International 2016. Mrs Planet 2016: Mrs India participated at Mrs Planet which was held at Sofia, Bulgaria where 26 Contestants from all around the Planet participated for coveted title of Mrs Planet 2016. Mrs India made India proud by winning Mrs Planet Star title. Mrs World 2016: Mrs India is participating World most prestigious, oldest and largest Beauty Pageant Mrs World from 2013, Mrs World 2016 is scheduled in October 2016. Mrs India is all set to represent India among 50 Nations across the World .Mrs India is confident enough to make mark and live the glory of India at Mrs World 2016. Thank you so much for Wonderful Post .